In honor of banned book week, Beacon director Helene Atwan checked in with one of America's most beloved (and sometimes banned) authors, Lois Lowry. Lois and Helene became friends while serving together on the board of PEN New England, a branch of PEN, the oldest human rights organization in the world. PEN has been fighting for free speech and the rights of readers and writers for decades. If you're a Poet, Essayist, Editor, Novelist, Bookseller, Librarian, or passionate reader and you haven’t been to any of the PEN programs, you will definitely want to jump to those web sites as soon as you’ve finished reading today's Beacon Broadside. Lowry is the acclaimed author of books for children, young adults, and readers of all ages, including the Anastasia Krupnik and Gooney Birds series. She is also the author of The Giver, which has sold over 5 million copies, won the American Library Association's Newbery Medal, and is currently being made into a motion picture by Warner Brothers. The Giver won another, more dubious honor from the ALA when it made its list of the 100 Most Frequently Challenged Books of 1990-1999, and the book continues to draw challenges around the country. Lois Lowry: I’d hate to see beautiful book jackets cluttered up that way! Seriously, it is always a surprise to me (and it shouldn’t be, any more, after so many years of it) when I am notified of a new challenge or attempt-to-ban. Most often, of course, it has been The Giver. But recently, in Washington state, it was Number the Stars... because it contains the word “damn,” (spoken by an adult, in reference to the Nazis attempted round-up of the Jews). And in Florida, a successful county-wide banning of my series about Anastasia Krupnik—published in the late seventies and early eighties, and never before banned. So it is increasing. I think it reflects the uncertainty of our times, and our fears for the next generation: what they will face, the dangers that await them. I sympathize with that. I share those fears on behalf of my own grandchildren. What is disheartening, though, is the mindless attempt to grapple with cultural problems by stifling freedom. It’s ironic that the most frequently challenged of my books—The Giver—portrays a society of the future. Parents find the portrayal “frightening.” “Too disturbing for kids,” they say, when they bring the challenges. And what they are describing is a portrait of society in which freedom has been taken away, a place that no longer has any books or art or music. HA: There are so many excellent authors who write for all ages and who have been repeatedly banned: Judy Blume, Robie Harris, Walter Dean Myers, Chris Crutcher, Katherine Paterson. Why do you think there's such overlap between exceptional work and work that is challenged by parents, schools, and/or librarians? LL: All of the authors you’ve mentioned write realistically and honestly about serious issues that affect young people. There is a large contingent of would-be censors who feel young people will be damaged in some way by reading such literature. Yet these are authors and books that kids love and learn from. Every now and then, when there is a public controversy over a book, kids will make their voices heard in a local newspaper or at a school board meeting. Teenagers in particular are very eloquent spokespeople for literary freedom. Often they are inspired by special programs such as Banned Books Week or by a school curriculum that calls attention to the issue. I have great admiration and appreciation for school administrators who support such programs. I remember once being on a live radio talk show in the South. I hadn’t realized it was a set-up, that the host—who had seemed so affable when he met me at the door to the radio station—had planned to encourage his listeners to trash me and my books. And so they did, while I sat there somewhat stunned, with my earphones on, stammering out inarticulate replies in my own defense. Then a young boy called in. I remember his name: Kevin. In his boyish, eloquent voice, he talked about his love of the books and what they had meant to him personally. It changed the whole tenor of the show. It was an astounding moment; the heartfelt words of a young reader were much more meaningful than anything I could have said. HA: What do you say to people who feel they need to “protect” readers, especially kids, from “disturbing” stories or material? LL: I rarely say anything to them individually. It serves no purpose. I say what I want to say in my books. When I receive hysterical letters—such as a recent one that told me Jesus would be ashamed of me—I simply write back briefly that I’m sorry they feel that way. It is largely librarians who are on the front lines, protecting literary freedom. They do such difficult, important, valuable work. All controversial authors are enormously grateful to librarians. HA: Did you ever read anything as a kid that kept you awake at night? Is that a bad thing? Worse than watching Hitchcock’s The Birds? LL: Ah, The Birds! For my own kids it was The Posiedon Adventure that kept them awake! Such mild movie-making compared to what is out there these days. For me, though, it was a book: a book my mother read to me when I was eight: The Yearling, by Marjorie Kinnan Rawlings. It contained every element guaranteed to terrify a little girl and cause her to weep into her pillow: it had a cold-hearted mother; a father horribly injured in front of his child; a best friend dead and carried to his grave by his brothers; and the young protaganist ordered to kill his beloved pet (and when he can’t bring himself to do it, his mother takes the gun and does it herself). The story (beautifully written, by the way) scared me, thrilled me, saddened me, haunted me throughout my childhood. It changed my literate life, made me loathe books like Nancy Drew that suddenly seemed shallow and pointless, and led me to search library shelves for other books that told the truth about life and loss. LL: There is plenty of stuff, not just books, that I wish weren’t out there. Junk food, violent video games, gangsta rap, Paris Hilton and Britney Spears. But no, I don’t advocate banning. Helene Atwan is Director of Beacon Press. 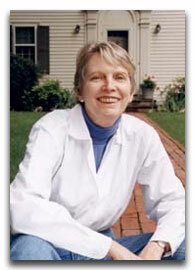 Visit Lois Lowry's website for more information about her books and upcoming appearances. To read more about Banned Books Week, visit the ALA's Banned Books Week website or visit your local library.